Gennady Gennadyevich Golovkin (Cyrillic: Геннадий Геннадьевич Головкин; born 8 April 1982), often known by his nickname "GGG" or "Triple G", is a Kazakhstani professional boxer. He is a former unified middleweight world champion, having held the WBA (Super), WBC, IBF, and IBO titles between 2010 and 2018. As of October 2018, he is ranked as the world's second best active middleweight by The Ring magazine, the Transnational Boxing Rankings Board (TBRB), and BoxRec. He is also ranked as the world's sixth best active boxer, pound for pound, by The Ring; third by BoxRec; and seventh by the TBRB. Golovkin won his first major world championship, the WBA interim middleweight title, by defeating Milton Núñez in 2010. The WBA elevated him to Regular champion status in the same year, and in 2011 he won the vacant IBO middleweight title by defeating Lajuan Simon. In 2014, Golovkin was elevated to his current status of WBA (Super) champion and successfully defended both his titles against Daniel Geale. Later that year he defeated Marco Antonio Rubio to win WBC interim middleweight title, and defeated David Lemieux for the IBF middleweight title in 2015. After Canelo Álvarez vacated his WBC middleweight title in 2016, Golovkin was elevated to full champion and held three of the four major world titles in boxing until being stripped by the IBF in 2018 for not fighting Serhiy Derevianchenko. A calculating pressure fighter, Golovkin is known for his exceptionally powerful and precise punching, balance, and methodical movement inside the ring. With a streak of 23 knockouts that spanned from 2008 to 2017, he holds the highest knockout-to-win percentage – 87.2% – in middleweight championship history, as well as the longest active unified championship reign, with five consecutive defenses. In 2016, he achieved his 17th title defense by knockout, which equaled the record set by Wilfredo Gómez in 1982. Golovkin is also said to have one of the most durable chins in modern boxing, having never been knocked down or knocked out in a total of 390 fights, 40 as a professional and 350 as an amateur. He has three brothers, two elder named Sergey and Vadim and a twin, Max. Sergey and Vadim had encouraged Golovkin to start boxing when Golovkin was eight years old. As a youth, Golovkin would walk the streets with them, who went around picking fights for him with grown men. When asked, "Are you afraid of him? ", Golovkin would respond "No", and be told to fight. "My brothers, they were doing that from when I was in kindergarten," Golovkin said. "Every day, different guys." When Golovkin was nine years old, Golovkin's two older brothers joined the Soviet Army. In 1990, the government had informed Golovkin's family that Vadim was dead. In 1994, the government told Golovkin's family that Sergey was dead. Golovkin's first boxing gym was in Maikuduk, Karaganda, Kazakhstan, where his first boxing coach was Victor Dmitriev, whom he regards as "very good". He became a scholarship holder with the Olympic Solidarity program in November 2002. At the 2004 Summer Olympics he beat Ramadan Yasser Abdelghafar 31 – 20 and Andre Dirrell 23 – 18, losing to the Russian Gaydarbek Gaydarbekov 18 -28 to take the silver medal. He qualified for the Athens Games by winning the gold medal at the 2004 Asian Amateur Boxing Championships in Puerto Princesa, Philippines. In the final he defeated home fighter Christopher Camat. At the world championships in 2005 he sensationally lost to Mohamed Hikal. He finished his amateur career with an outstanding record of 345–5. After ending his amateur career in 2005, Golovkin signed a professional deal with the Universum Box-Promotion (UBP) and made his professional debut in May 2006. By the end of 2008, Golovkin's record stood at 14–0 (11 KO) and while he had few wins over boxers regarded as legitimate contenders, he was regarded as one of the best prospects in the world. Golovkin was given 4 more relatively easy bouts in 2009. In 2010, Universum started to run into financial issues after having been dropped by German television channel ZDF. This caused a number of issues for Golovkin who was effectively unable to fight in Germany, and contract disputes between the two parties got complicated. Golovkin terminated his contract with Universum in January 2010 and stated the following in an interview: "The reason for this decision is that I've always been placed behind Felix Sturm and Sebastian Zbik by Universum. Our demands to fight against Felix Sturm or Sebastian Zbik have been always rejected on absurd grounds. Universum had no real plan or concept for me, they did not even try to bring my career forward. They would rather try to prevent me from winning a title as long as Sturm and Zbik are champions. Further more, bouts against well-known and interesting opponents were held out in prospect, but nothing happened. This situation was not acceptable. It was time to move forward." After cutting ties with Universum, the WBA issued an interim title fight between Golovkin, ranked #1 at the time, and Milton Núñez. Golovkin routed Núñez, defeating him in 58 seconds to become a world champion. Golovkin was promptly upgraded to WBA (Regular) champion. He tried to fight WBA (Super) champion Felix Sturm and Hassan N'Dam N'Jikam during this time, but was unable to get them in the ring. Oleg Hermann, Golovkin's manager, said "It is very hard to find a good opponent. Everybody knows that Felix Sturm is afraid of Gennady. Strictly speaking, Sturm should get out of boxing and become a marathon runner because he is running fast and long. He has an excellent chance to become a champion in athletics." Golovkin was determined to become a worldwide name, dreaming of following in the Klitschko brothers' footsteps by fighting in Madison Square Garden and Staples Center. He signed with K2 Promotions and went into training in Big Bear, California with Abel Sanchez, the veteran trainer behind Hall of Famer Terry Norris and many other top talents. Sanchez was stunned by and impressed with Golovkin's talent and attitude from their first meeting. He has since then worked to add Mexican-style aggression to Golovkin's Eastern European-style amateur discipline, thereby producing a formidable hybrid champion. "I have a chalkboard in the gym, and I wrote Ali's name, Manny Pacquaio's name and his name," Sanchez said. "I told him, 'You could be right there.' He was all sheepish, but once I felt his hands, and I saw how smart he was in the ring and how he caught on... sheesh. He's going to be the most-avoided fighter in boxing, or he's going to get the chance he deserves." Golovkin was scheduled to make his HBO debut against Dmitry Pirog (20-0, 15 KOs) in August 2012. Pirog had vacated his WBO middleweight title to face Golovkin. This was because Pirog had been mandated to fight interim champion Hassan N'Dam N'Jikam. Weeks before the fight, it was announced that Pirog had suffered a back injury—a ruptured disc—that would prevent him from fighting on the scheduled date, but Golovkin would still face another opponent on HBO. Several comeback attempts by Pirog were thwarted by ongoing back problems, effectively forcing his premature retirement. On July 20, 2012 it was announced that Golovkin would defend his titles against European champion and The Ring's #10-rated middleweight Grzegorz Proksa (28–1, 21 KOs) on September 1 at the Turning Stone Casino in Verona, New York. The fight was televised on HBO in the United States and Sky Sports in the UK. Golovkin put on an impressive performance in his American debut by battering Proksa to a fifth-round TKO, which was Proksa's first loss by knockout. Proksa praised Golovkin's power, "The guy hits like a hammer. I tried everything, but it did not work. You have to give him credit, because he had a good handle on the situation and it was an honor to meet him in the ring." CompuBox Stats showed that Golovkin landed 101 of 301 punches thrown (34%) and Proksa landed 38 of his 217 thrown (18%). Distant view of Golovkin fighting against Gabriel Rosado at Madison Square Garden in January 2013. In October, when the WBA (Super) middleweight champion Daniel Geale signed to fight Anthony Mundine in a rematch, the WBA stripped Geale of the title and named Golovkin the sole WBA champion at middleweight. On November 30, 2012 it was announced that Golovkin would next fight The Ring's #9-rated light middleweight Gabriel Rosado (21–5, 13 KO) on the HBO Salido-Garcia card in the co-main event. on January 19, 2013. It was said that Golovkin would agree a catchweight of 158 pounds, two pounds below the middleweight limit. Rosado later rejected the proposal, stating he would fight at the full 160 pound limit. Golovkin continued his stoppage-streak with a TKO victory over Rosado. The fight was halted when Rosado's corner threw in the towel to save Rosado, who was battered and bleeding heavily from his nose and left eye. At the time of the stoppage, Golovkin led on the judges' scorecards 60–54, 60–54, and 59–55. According to CompuBox Stats, Golovkin landed 208 of 492 punches thrown (42%) and Rosado landed only 76 of his 345 thrown (22%). Golovkin fought British former two-time world title challenger Matthew Macklin (29-4, 20 KOs) at the MGM Grand at Foxwoods Resort in Mashantucket, Connecticut on June 29, 2013. The fight was officially announced in April. Macklin previously lost back to back world title fights against Felix Sturm and Sergio Martinez in 2011 and 2012, respectively. Golovkin stated that he wanted to fight a further two times in 2013. This was rare to hear from a world champion as majority fight only 2 or 3 times a year. There was a total of 2,211 fans in attendance. Macklin was billed as Golovkin's toughest opponent to date. In round 1, Golovkin landed clean with his right hand and sent Macklin against the ropes, although it could have been ruled a knockdown because it appeared that only the roped kept Macklin on his feet, referee Eddie Cotton, ruled out the knockdown. Golovkin dominate the first two rounds. In the third round, Golvokin landed a right uppercut followed by a left hook to the body. Macklin, in pain was counted out and the fight was stopped at 1 minute 22 seconds of the round. Macklin called Golovkin the best opponent he has fought in the post-fight interview. Golovkin retained his WBA and IBO world titles. CompuBox Stats showed that Golovkin landed 58 of 116 punches thrown (50%) and Macklin landed 29 of 118 (25%).He earned $350,000 compared to the $300,000 earned by Macklin. The fight averaged 1.1 million viewers. On August 18, 2013 Sports Illustrated announced that Golvokin would next defend with world titles against The Ring's #9-rated middleweight Curtis Stevens (25–3, 18 KO) at the Madison Square Garden Theater in Manhattan, New York on November 2. At the time, Stevens was ranked #5 WBC and #6 IBF. Main Events, who promote Stevens, initially turned down a $300,000 offer. It was likely K2 promotions offered an increase to get Stevens in the ring with Golovkin. In front of 4,618, Golovkin successfully retained his titles against Stevens via an eighth-round technical knockout, methodically breaking down the latter with many ferocious punches to the head and body. Stevens went down hard in the 2nd from two left hooks to the head, and after watching their fighter absorb enormous punishment Stevens' corner called for a halt in the 8th. At the time of stoppage, Golovkin was ahead 80–71, 79–71, and 79–72. The event captured huge interest around the world, with it being broadcast in more than 100 countries worldwide, including SKY in the United Kingdom, Channel 1 in Russia and Polsat TV in Poland. The win was Golovkin's 15th straight stoppage victory and further cemented his status as one of the greatest finishers in the middleweight division. After the fight, Golovkin said, "He was strong, and I was a little cautious of his strength, but I felt comfortable in there and never felt like I was in any trouble [...] I am ready to fight anybody, but, specifically, I want to fight [lineal champion] Sergio Martinez." CompuBox Stats showed that Golovkin landed 293 of 794 punches thrown (37%), which included 49% of power punches landed, while Stevens landed 97 of 303 thrown (32%). Golovkin's purse was $400,000 while Stevens received $290,000. The fight averaged 1.41 million viewers on HBO and peaked at 1.566 million. Golovkin's camp requested that he be awarded the WBA (Super) middleweight title in December 2013, but this was refused by the WBA, as Golovkin was already granted special permission for a fight prior to his mandatory commitment. Golovkin's tenth title defense took place in Monte Carlo against former title challenger Osumanu Adama (22–3, 16 KO) on February 1, 2014. HBO released a statement on January 22 confirming they could not televise the bout in the US. The reason stated was because of the size of the venue Salle des Etoiles and production issues. Coming into the fight, Adama was ranked #12 by the WBA. Golovkin won via seventh round stoppage. At the end of the 1st round, Golovkin dropped Adama with a solid jab and right hand. Golovkin went on to drop Adama again in the 6th by landing two sharp left hooks to his head, and then again in the 7th with a hard jab. Golovkin then nailed Adama with a left hook to the jaw, sending Adama staggering and forcing the referee to stop the bout. When the reporter asked Golovkin, after the fight, who he would to fight next, he replied, "I want to fight Sergio Martinez to prove who's the best middleweight." At the time of stoppage, one judge had it 60–52 and the other two at 59–53 in favour of Golovkin. A day after defeating Adama, a fight with Irish boxer Andy Lee (31-2, 22 KOs) was being discussed for April 26, which was the next time Golovkin would appear on HBO at the Theater at Madison Square Garden. It was reported on February 28 that a deal was close to being made, however on March 1, the fight was called off when Golovkin's father passed away after suffering a heart attack, aged 68. Due to beliefs, they have a 40-day mourning period, K2 director Tom Loeffler explained. On June 3, 2014, after ten successful title defenses, the World Boxing Association officially elevated Golovkin from Middleweight champion to (Super) champion. Golovkin was also granted a special permission to defend his title against Daniel Geale. Golovkin had been previously ordered to face #2 Jarrod Fletcher. K2 Promotions announced Golovkin would fight against The Ring's #2-rated middleweight Daniel Geale (30-2, 16 KOs) at the Madison Square Garden Theater in New York on July 26, 2014 live on HBO. In front of 8,572 at The Theater, Golovkin successfully defended his title for the 11th time, defeating Geale via a third round stoppage. Golovkin dropped Geale in the second round. A right hand in the third sent Geale down again from which he never recovered completely. A staggering Geale prompted a swift stoppage from referee Michael Ortega. Geale's defeat started from a stiff Golovkin Jab, according to GGG's trainer Abel Sanchez, "Gennady hit him with a jab in the second round and that was a telling point." The accuracy of punches by both fighters were at the 29% mark by Compubox, but the effectiveness of those that connected resulted in a noteworthy win for Golovkin in his record. Golovkin earned $750,000 compared to Geale who received $600,000. The fight averaged 984,000 viewers and peaked 1.048 million viewers on HBO. This was a big dip compared to what Golovkin achieved against Stevens, the last time he appeared on HBO. On August 12, 2014 it was rumored that Golovkin would next fight former multiple time world title challenger and then Interim WBC champion Marco Antonio Rubio (59-6-1, 51 KO). On August 20, the fight between Golovkin and Rubio was made official. K2 Promotions announced the fight would place on October 18, 2014 o HBO at the StubHub Center in Carson, California. It would mark the first time Golovkin would fight in the West Coast. Golovkin spoke to ESPN about the announcement, "I'm very excited to fight in California. I always enjoy attending fights at the StubHub Center and look forward to a Mexican-style fight against Marco Antonio Rubio." Rubio failed to make weight, weighing in at 161.8 pounds, thus losing the Interim WBC title on the scales. Rubio was given the 2 hour timescales to lose the extra weight, but decided against this. The fight still went ahead. The record attendance of 9,323 was announced. Golovkin outworked Rubio in a competitive first round, landing more punches. In the second round, Golovkin landed an overhand power left to the head of Rubio with Rubio on the ropes. Rubio then went to his back on the canvas, and took the full ten count in Spanish from referee Jack Reiss. After the knockout, Rubio got up and was motioning with a glove to the back of his head to the referee. However, the knockout blow was clean, and the count, which was given in Spanish was of normal speed. Golovkin retained his WBA 'Super', IBO middleweight titles and won the Interim WBC title which made him mandatory challenger to full titleholder Miguel Cotto. Golovkin in the post fight showed respect, "Rubio, he does not step back. He is a good fighter. I respect him. It was a very hard punch." Rubio earned $350,000 after having to forfeit $100,000 to Golovkin for not making weight, who earned a base purse of $900,000 not including any pay through his promoter. With this being Golovkin's 12th successive defense, it tied him with Marvelous Marvin Hagler and Felix Sturm for third-most in middleweight history. ESPN reported the fight averaged 1.304 million viewers and peaked at 1.323 million. On February 21, 2015, Golovkin defended his middleweight titles against British boxer Martin Murray (28-1-1, 12 KOs) in Monte Carlo. The fight was officially announced in October 2014. Murray started the fight off well defensively, but by the fourth round Golovkin began to heat up and started finding Murray consistently. Murray was knocked down twice in the fourth round, even sustaining an additional punch to the head while down on a knee. Golovkin found it much easier to land his punches on Murray in the middle-rounds. Although Murray's chin withstood a lot of Golovkin punches in those middle-rounds, he eventually went down again in round 10 after sustaining a lot of punishment. Murray came out for round 11 and therefore had lasted longer in the ring with Golovkin than any other of his opponents so far, although Murray came out with a bloodied countenance and Golovkin continued to connect with shots, the referee stopped the bout as he felt Murray was not fighting back effectively and had taken too many punches. CompuBox statistics showed Golovkin landing 292 of 816 punches (36%), and Murray connected on 131 of 469 (28%). The fight aired on HBO in the USA during the afternoon and averaged 862,000 viewers. At the time of stoppage, the three judges had their respective scorecards reading 100–87, 99–88, and 99–88 in favour of Golovkin. The fight was televised live on HBO in the US in the afternoon and averaged 862,000 viewers, peaking at 938,000 viewers. Although it was a decline in viewership for Golovkin on HBO, it was expected as it was shown during the day and not peak time. Golovkin's victory over Murray was his 13th consecutive successful title defense, placing him third all-time in consecutive middleweight title defenses behind Bernard Hopkins (19) and Carlos Monzón (14). Boxing Insider reported that a deal had been agreed for Golovkin to defend his titles against American Willie Monroe Jr. (19-1, 6 KOs) at The Forum, Inglewood, California on May 16, 2015. In front of 12,372, Golovkin defeated Monroe via sixth-riound TKO, to extend his KO streak to 20. In the first minute of the first round, Monroe started fast with superior movement and jabs, but after that the pace slowed with GGG cutting off the ring and outworking him. In round six, GGG came forward and quickly caught an off guard Monroe with power shots along the ropes, and Monroe went down to his knees, just beating the ten count of referee Jack Reiss. Referee Reiss was willing to give Monroe another chance, but Monroe did not respond. Reiss immediately stopped the contest. Monroe was dropped a total three times. At the time of the stoppage, the scorecards read 50–43, 50–43, and 49–44 for Golovkin. Golovkin landed 133 of 297 punches thrown (45%), Monroe landed 87 punches of 305 thrown (29%). In the post-fight, Golovkin said, "Willie is a good fighter, a tough fighter. I feel great. My performance was special for you guys. This was a very good drama show. This was for you." He then spoke about future fights, "I stay here. I am the real champion. I want unification. Let's go, let's do it guys. Who is No. 1 right now? Bring it on. I will show you." In regards to unification and big fights, the names of Miguel Cotto, Saúl Álvarez and Andre Ward were mentioned. Golovkin received a purse of $1.5 million and Monroe earned $100,000 for the fight. The fight drew an average viewership of 1.338 million and peaked at 1.474 million viewers. It was announced in July 2015 that Golovkin would be defending his three world titles against IBF world champion David Lemieux (34–2, 31 KOs) in a unification fight at the Madison Square Garden in New York City on October 17, 2015 live by HBO Pay-Per-View. Both boxers took to Twitter to announce the news. Lemieux won the then vacant IBF title by outpointing Hassan N'Dam N'Jikam in June 2015. Golovkin defeated Lemieux via eighth-round technical knockout to unify his WBA (Super), IBO, and WBC Interim middleweight titles with Lemieux's IBF title. Golovkin established the pace with his jab while landing his power shots in between, keeping Lemieux off-balance the entire night. Lemieux was dropped by a body shot in the fifth round and sustained an additional punch to the head after he had taken a knee. He was badly staggered in the eighth, so the referee was forced to halt the bout. With this 21st consecutive knockout victory, Golovkin passed Monzón for most consecutive middleweight title defenses with 15. Golovkin landed 280 of 549 punches thrown (51%) whilst Lemieux landed 89 of 335 (27%). The fight generated 153,000 PPV buys on HBO and generated a further $2 million live gate from the sold out arena. The fight was replayed later in the week and averaged 797,000 viewers and peaked just over 1 million viewers. On February 10, 2016, it was announced that Golovkin would defend his IBF and WBA middleweight titles on HBO against IBF mandatory challenger Dominic Wade (18–0, 12 KOs) on April 23 at The Forum in Inglewood, California. This bout wasn't expected to be very competitive for Golovkin, who also stated that he wouldn't underestimate Wade and added, "I’m happy to fight again at the Forum in front of my fans and friends in Los Angeles, Dominic Wade is a very hungry and skilled middleweight who is undefeated and will be another big test for me." Wade was very thankful for getting the opportunity to fight Golovkin, "I am so grateful to be given the opportunity to fight ‘GGG’ for the IBF Middleweight Championship on April 23! I’ve worked hard my entire career to get to this point. I’m poised and ready to take on the challenge." The card was co-featured by Roman Gonzalez who successfully defended his WBC flyweight title with a unanimous points decision over McWilliams Arroyo. In front of a sellout crowd of 16,353, Golovkin successfully defended his middleweight titles with an early stoppage of Wade, his 22nd successive knockout. Wade was knocked down three times before the fight was stopped with 23 seconds remaining in round 2. According to CompuBox stats, Golovkin landed 54 of 133 punches (41%), with most being power punches. Wade managed to land 22 of his 75 thrown (29%). After the fight, when asked about Canelo Álvarez, Golovkin said, "I feel great. I'm here now, and I'm here to stay. I'm not going anywhere. Give me my belt, give me my belt! Let's fight," Golovkin reportedly earned a career high $2m for this fight compared to the $500,000 that Wade earned. The fight drew an average of 1,325,000 viewers and peaked at 3,888,000 on HBO. Following Canelo Álvarez's victory against Miguel Cotto, talks began between the Golovkin and Álvarez camps over the future WBC title defense. In the end, an agreement was ultimately reached to allow interim bouts before the fight to, in the words of WBC president Mauricio Sulaiman, "maximize the interest in their highly anticipated showdown. The fight was anticipated to take place well into 2016. On May 18, 2016, Álvarez vacated the WBC middleweight title, which resulted in Golovkin being immediately awarded the title by the WBC who officially recognized him as their middleweight champion. On July 8, 2016, it was announced that Golovkin would defend his world middleweight titles against undefeated British IBF welterweight champion Kell Brook (36–0, 25 KOs). The fight took place on September 10, 2016, at the O2 Arena in London, England. Brook was scheduled to fight in a unification bout against Jessie Vargas, whereas there was negotiations for Golovkin to fight Chris Eubank Jr.; however, negotiations fell through and Brook agreed to move up two weight divisions to challenge Golovkin. This was Golovkin's 7th world title defence. The fight aired in the United States on HBO and on Sky Box Office pay-per-view in the United Kingdom. On September 5, the WBA withdrew its sanction for the fight. Although they granted Golovkin a special permit to take the fight, they stated that their title would not be at stake. The reason for the withdrawal was because Brook had never competed in the middleweight division. WBA president Gilberto Mendoza Jr. said, "What I most regret is that there are no boxers at 160 pounds who will fight against 'Triple G,' and Brook has to move up two divisions to fight against him." The Golovkin camp were said to be disappointed with the decision with promoter Tom Loeffler saying, "somehow the WBA thought it was too dangerous for a welterweight to move up to middleweight to fight the biggest puncher in boxing. I guess that is a compliment to GGG as they sanctioned [Adrien] Broner moving up two divisions [from lightweight to welterweight] to fight Paulie [Malignaggi in 2013] and Roy Jones moving up two divisions [from light heavyweight to heavyweight] to fight John Ruiz [in 2003] for WBA titles, and Kell Brook is undefeated and considered a top pound-for-pound boxer." Golovkin came out aggressively, going as far as to buckle the Brook's legs in the first round. He was met with stiff resistance as Brook began to fire back, connecting multiple clean combinations on Golovkin, none of which were able to faze him. In the second round Brook had his greatest success of the fight, but in the process had his right eye socket broken. Over the next three rounds, Golovkin began to break Brook down. The Englishman showed courage, determination and a great chin as he absorbed the bulk of a Golovkin onslaught. Despite the fight being even on two judges' scorecards, and one judge having Brook ahead by a point, the latter's corner threw in the towel to protect their fighter's damaged right eye, ending the fight in round 5 with both boxers still standing. Speaking after the fight, Golovkin said, "I promised to bring 'Big Drama Show,' like street fight. I don't feel his power. I feel his distance. He has great distance. He feels [my power], and after second round I understand that it's not boxing. I need street fight. Just broke him. That's it." Brook said, "I'm devastated. I expected him to be a bigger puncher. I think in the second round, he broke my eye socket. He caught me with a shot, and I was starting to settle into the fight, but I was seeing three or four of him, so it was hard to get through it. I was tricking him. His shots were coming underneath, and I was frustrating him. I was starting to settle into him, but when you see three or four of them, it is hard to carry on." Golovkin stated although Brook fought like a true champion, he was not a middleweight. According to Compubox stats, Golovkin landed 133 of his 301 punches thrown (44.2%), whilst Brook landed 85 punches, having thrown 261 (32.6%). The fight was aired live on HBO in the afternoon and drew an average of 843,000 viewers and peaked at 907,000 viewers. This was considered by HBO to be a huge success for an afternoon showing. A replay was shown later in the evening as part of the world super flyweight title fight between Roman Gonzalez and Carlos Cuadras. The replay averaged 593,000 viewers. Golovkin earned a guaranteed $5 million purse. Brook was guaranteed slightly less, around £3 million, but earned an upside of PPV revenue. Following the win over Brook, there were immediate talks of a WBA unification fight against 'Regular' champion Daniel Jacobs (32–1, 29 KOs), as part of WBA's plan to reduce the amount of world titles in each division from three to one. Team Golovkin spoke of fighting Billy Joe Saunders after the Jacobs fight which would be a middleweight unification fight for all the belts. The date discussed initially was 10 December, which Golovkin's team had on hold for Madison Square Garden. The date was originally set by HBO for Álvarez after he defeated Liam Smith, but Canelo confirmed he would not be fighting again until 2017 after fracturing his right thumb. There was ongoing negotiations between Tom Loeffler and Al Haymon about the split in purses, if the fight goes to purse bids, it would be a 75–25 split with Golovkin taking the lions share due to him being the 'Super' champion. As the negotiations continued, Jacobs wanted a better split, around 60–40. The WBA granted an extension for the negotiation period on 7 October, as the two sides originally had until October 10 to come to an arrangement or else a purse bid would be due. There was also a request to change the purse bid split to 60–40, which the WBA declined. Golovkin started his training camp for the fight on 17 October. Loeffler told the LA Times on 18 October, although the negotiations remain active, the fight will not take place on December 10. A new date for early 2017 would need to be set, still looking at Madison Square Garden to host the fight. Golovkin prides himself on being an extremely active fighter, and this is the first year since 2012 that he has been in fewer than three fights. WBA president Gilberto Mendoza confirmed in an email to RingTV that a deal had to be made by 5pm on December 7 or a purse bid would be held on December 19 in Panama. Later that day, the WBA announced a purse bid would be scheduled with a minimum bid of $400,000, with Golovkin receiving 75% and Jacobs 25%. Although purse bids were announced, Loeffler stated he would carry on negotiations, hopeful that a deal would be reached before the purse bid. On December 17, terms were finally agreed and it was officially announced that the fight would take place at Madison Square Garden in New York City on March 18, 2017 exclusively on HBO PPV. Golovkin tweeted the announcement via whilst Jacobs uploaded a quick video on social media. At the time of the fight, both fighters had a combined 35 consecutive knockouts. It was reported that Golovkin's IBO world title would not be at stake. The IBO website later confirmed the belt would be at stake. HBO officially announced the fight on December 22, being billed as "Middleweight Madness". Loeffler confirmed there was no rematch clause in place. At the official weigh-in, a day before the fight, Golovkin tipped the scales at 159.6 lb, while Jacobs weighed 159.8 lb. Jacobs declined to compete for the IBF title by skipping a fight-day weight check. Unlike other major sanctioning bodies, the IBF requires participants in title fights to submit to a weight check on the morning of the fight, as well as the official weigh-in the day before the fight; at the morning weight check, they can weigh no more than 10 pounds (4.5 kg) above the fight's weight limit. Jacobs weighed 182 lb on fight night, 12 more than Golovkin. In front of a sell out crowd of 19,939, the fight went the full 12 rounds. This was the first time that Golovkin fought 12 rounds in his professional career. Golovkin's ring control, constant forward pressure and effective jab lead to a 115–112, 115–112, and 114–113 unanimous decision victory, ending his 23 fight knockout streak which dated back to November 2008. ESPN had Golovkin winning 115–112. The opening three rounds were quiet with very little action. In the fourth round, Golovkin dropped Jacobs with a short right hand along the ropes for a flash knockdown. Jacobs recovered, but Golovkin controlled most of the middle rounds. Jacobs was effective in switching between orthodox and southpaw stance, but remained on the back foot. Both boxers were warned once in the fight by referee Charlie Fitch for rabbit punching. According to Compubox punch stats, Golovkin landed 231 of 615 punches (38%) which was more than Jacobs who landed 175 of 541 (32%). Following the fight, some doubted Golovkin did enough to win. Jacobs thought he had won the fight by two rounds and attributed the loss due to the potential big money fight that is Golovkin vs. Canelo. Jacobs also stated after being knocked down, he told Golovkin, "he'd have to kill me." In the post-fight interview, Golovkin said, “I’m a boxer, not a killer. I respect the game.” Before revenue shares, it was reported that Golovkin would earn at least $2.5 million compared to Jacobs $1.75 million. On March 24, Tom Loeffler revealed the fight generated 170,000 pay-per-view buys. A replay was shown on HBO later in the week and averaged 709,000 viewers. Lance Pugmire from LA Times reported the live gate was $3.7 million, a big increase from the Golovkin vs. Lemieux PPV which did $2 million. He also said that merchandise and sponsors were higher. After retaining his belts against Jacobs, Golovkin stated that he wanted to unify the middleweight division and hold all the belts available. The only major belt not belonging to him was the WBO title held by British boxer Billy Joe Saunders. After defeating Jacobs, Golovkin said, "My goal is all the belts in the middleweight division. Of course, Billy Joe is the last one. It is my dream." There was rumours of the fight taking place in Golovkin's home country Kazakhstan in June during the EXPO 2017. The last time Golovkin fought in his home country was in 2010. On March 20, Golovkin said that he would fight Saunders in his native Kazakhstan or the O2 Arena in London. Saunders tweeted on social media that although he didn't watch Golovkin's fight with Jacobs, he was ready to fight him. Saunders claimed to have signed the contract on his end and gave Golovkin a deadline to sign his. On March 29, promoter Frank Warren also stated that Golovkin would have ten days to sign for the fight. Saunders later claimed to have moved on from Golovkin, until Warren said the deal was still in place. Over the next week, Saunders continued to insult Golovkin through social media. On April 7, Warren told iFL TV, that Golovkin had a hand injury, which was the reason why the fight hadn't been made. In the interview, he said, "At the moment, they’re saying that Golovkin’s injured. So we’re waiting to see where this is all going. But as far as I’m concerned, we agreed [to] terms." It was also noted that he would wait until May 6, for any updates. On April 11, it was reported that the fight would not take place and Golovkin would ultimately focus on a September 2017 fight against Canelo Álvarez. Immediately after the Chavez fight on May 6, Canelo Álvarez announced that he would next fight Golovkin on the weekend of September 16, 2017 at a location to be determined. Golovkin, who before the fight stated he would not attend, was joined by his trainer Abel Sanchez and promoter Tom Loeffler. Golovkin joined him in the ring during the announcement to help promote their upcoming bout. Speaking through a translator, Álvarez said, "Golovkin, you are next, my friend. The fight is done. I've never feared anyone, since I was 15 fighting as a professional. When I was born, fear was gone." When Golovkin arrived in the ring, he said, "I feel very excited. Right now is a different story. In September, it will be a different style -- a big drama show. I'm ready. Tonight, first congrats to Canelo and his team. Right now, I think everyone is excited for September. Canelo looked very good tonight, and 100 percent he is the biggest challenge of my career. Good luck to Canelo in September." In the post-fight press conference, both boxers came face to face and spoke about the upcoming fight. On May 9, Eric Gomez, president of Golden Boy Promotions told the LA Times that Álvarez had an immediate rematch clause in place on his contract, whereas Golovkin, if he loses, won't be guaranteed a rematch. Oscar De La Hoya later also revealed in an interview with ESPN the fight would take place at the full middleweight limit of 160 pounds with no re-hydration clauses, meaning Golovkin and Álvarez would be able to gain unlimited amount of weight following the weigh in. On June 5, the T-Mobile Arena in Las Vegas was announced as the venue of the fight, and would mark the first time Golovkin would fight in Nevada. The AT&T Stadium, Madison Square Garden and Dodger Stadium missed out on hosting the fight. Eric Gomez of Golden Boy Promotions said in a statement that Álvarez would fight for the IBF meaning he would participate in the second day weight in, which the IBF require that each boxer weighs no more than 10 pounds over the 160 pound limit. Although he said there was no word on whether Álvarez would fight for the WBC title, Álvarez claimed that he would not be. On July 7, 2017 Golden Boy and K2 Promotions individually announced the tickets had sold out. On August 15, Golden Boy matchmaker Robert Diaz revealed that Álvarez would indeed attend the IBF mandatory second day weigh in and fully intended to fight for the IBF title along with the WBA title. He did make it clear that whilst Golovkin would still defend the WBC and IBO title, Álvarez would not pay their sanctioning fees. On August 22, IBF president Daryl Peoples announced that they would be dropping the mandatory second day weigh in for unification fights, meaning neither fighters are required to participate, however they would still encourage them to do so. It was reported that Álvarez would earn a base minimum $5 million and Golovkin would earn $3 million, before any shares of the revenue are added to their purses. On fight night, in front of a sold out crowd of 22,358, Golovkin and Álvarez fought to a split draw (118–110 Álvarez, 115–113 Golovkin, and 114–114). ESPN's Dan Rafael and HBO's Harold Lederman scored the fight 116–112 in favour of Golovkin. Judge Adalaide Byrd's scorecard of 118–110 in favour of Álvarez was widely ridiculed. Many observers felt that Golovkin had won a narrow, closely contested fight, and while a draw was justifiable, a card that wide in favour of Álvarez was inexcusable. Nevertheless, Bob Bennett, director of the Nevada Athletic Commission, said that he had full confidence in Byrd going forward. Despite the controversy, several mainstream media outlets referred to the bout as a "classic". The fight started with both boxers finding their rhythm, Álvarez using his footwork and Golovkin establishing his jab. During the middle rounds, particularly between 4 and 8, Álvarez started each round quick, but seemed to tire out after a minute, with Golovkin taking over and doing enough to win the rounds. The championship rounds were arguably the best rounds and Álvarez started to counter more and both fighters stood toe-to-toe exchanging swings, the majority of which missed. The draw saw Golovkin make his 9th consecutive defence. CompuBox stats showed that Golovkin was the busier of the two, landing 218 of 703 thrown (31%), while Álvarez was more accurate, landing 169 of his 505 thrown (34%). Golovkin out punched Álvarez in 10 of the 12 rounds. The replay, which took place a week later on HBO averaged 726,000, peaking at 840,000 viewers. Speaking to Max Kellerman after the fight, Golovkin said, "It was a big drama show. [The scoring] is not my fault. I put pressure on him every round. Look, I still have all the belts. I am still the champion." Álvarez felt as though he won the fight, "In the first rounds, I came out to see what he had. Then I was building from there. I think I won eight rounds. I felt that I won the fight. "I think I was superior in the ring. I won at least seven or eight rounds. I was able to counterpunch and made Gennady wobble at least three times. If we fight again, it's up to the people. I feel frustrated over my draw." Golovkin's trainer Abel Sanchez believed judge Byrd had her scorecard filled out before the first bell rang. Álvarez ruled out another fight in 2017, claiming he would return on Cinco de Mayo weekend in May 2018. At the post-fight press conference, Álvarez said through a translator, “Look, right now I wanna rest. Whatever the fans want, whatever the people want and ask for, we’ll do. You know that’s my style. But right now, who knows if it’s in May or September? But one thing’s for sure – this is my era, the era of Canelo.” Golovkin's promoter Tom Loeffler stated that they would like an immediate rematch, but Golovkin, who prefers fighting at least three times in a calendar year, reiterated his desire to also fight in December. WBO middleweight champion Saunders said he was ready for Golovkin and looking to fight in December too. The fight surpassed Mayweather-Álvarez to achieve the third highest gate in boxing history. ESPN reported the fight generated $27,059,850 from 17,318 tickets sold. 934 complimentary tickets were given out, according to the NSAC. Mayweather vs. Álvarez sold 16,146 tickets to produce a live gate of $20,003,150. The replay, which took place a week later on HBO averaged 726,000, peaking at 840,000 viewers. The LA Times reported the fight generated 1.3 million domestic PPV buys. Although HBO didn't make an official announcement, it is believed that the revenue would exceed $100 million. Immediately after the controversial ending, talks began for a rematch between Álvarez and Golovkin. Álvarez stated he would next fight in May 2018, whereas Golovkin was open to fighting in December 2017. ESPN reported that Álvarez, who only had the rematch clause in his contract, must activate it within three weeks of their fight. On September 19, Golden Boy Promotions president Eric Gomez told ESPN that everyone on their side was interested in the rematch and they would hold discussions with Tom Loeffler in the next coming days. Ringtv reported that the negotiations would begin on September 22. On September 24, Gomez said the rematch would likely take place in the first week of May 2018, or if a deal could be worked, we could see the fight take place as early as March. Despite ongoing negotiations for the rematch, at the 55th annual convention in Baku, Azerbaijan on October 2, the WBC officially ordered a rematch. Golden Boy president Eric Gomez told ESPN, "Regardless of if they did or didn't order the rematch, we are going to try to make it happen. We'll do whatever it takes to make it happen." On November 7, Eric Gomez indicated the negotiations were going well and Álvarez would make a decision in regards to the rematch in the coming weeks. It was believed that Golden Boy would wait until after David Lemieux and Billy Joe Saunders fought for the latter's WBO title on December 16, 2017 before making a decision. On November 15, Eddie Hearn, promoter of Daniel Jacobs stated that he approached Tom Loeffler regarding a possible rematch between Golovkin and Jacobs if the Álvarez-Golovkin rematch failed to take place. On December 20, Eric Gomez announced that the negotiations were close to being finalized after Álvarez gave Golden Boy the go-ahead to write up the contracts. On January 29, 2018 HBO finally announced the rematch would take place on May 5 on the Cinco de Mayo weekend. On February 22, the T-Mobile Arena was again selected as the fight's venue. According to WBC, unlike the first bout, Álvarez would fight for their title. On March 5, 2018, Álvarez tested positive for the banned substance clenbuterol ahead of the fight. Adding to the controversy, Golovkin's trainer Abel Sanchez claimed that Álvarez had his hands wrapped in an illegal manner for the first fight. On March 23, the Nevada State Athletic Commission temporarily suspended Álvarez due to his two positive tests for the banned substance clenbuterol. Álvarez was required to appear at a commission hearing, either in person or via telephone, on the issue on April 10. The commission would decide at the hearing whether the fight would be permitted to go ahead as scheduled. Tom Loeffler stated that Golovkin intended to fight on May 5, regardless of his opponent being Álvarez or anyone else. On March 26, former two-time light middleweight champion Demetrius Andrade (25-0, 16 KOs), who started campaigning at middleweight in 2017, put himself into the equation and offered to fight Golovkin on May 5. On March 29, IBF mandatory challenger Sergiy Derevyanchenko's manager Keith Connolly told Boxing Scene that Derevyanchenko would be ready to replace Álvarez and fight Golovkin in his place if the fight was to get postponed on April 10. On March 28, MGM Resorts International, who owns the T-Mobile Arena, started to offer full refunds to anyone who had already purchased tickets for the bout. They wrote, “In the event a fan requested a refund, they could get one at the original point of sale and in full.” The Las Vegas Review-Journal reported the news. Álvarez's hearing was rescheduled for April 18 as Bob Bennett filed a complaint against Álvarez. On April 3, Álvarez officially withdrew from the rematch. Golden Boy mentioned during a press conference it was hinted that Álvarez would likely not be cleared at the hearing and they would not have enough time to promote the fight. At the hearing, Álvarez was given a six-month suspension, backdated to his first drug test fail on February 17, meaning the ban would end on August 17, 2018. His promoter De La Hoya then announced that Álvarez would return to the ring on the Mexican Independence Day weekend. On April 2, before Álvarez withdrew from the rematch, Loeffler stated that Golovkin would fight on May 5, regardless of whether it would be Álvarez or another boxer and the fight would take place at the MGM Grand Garden Arena in Paradise. On fighting, Golovkin said, "I am looking forward to returning to Las Vegas for my 20th title defense and headlining my first Cinco De Mayo event on May 5. It is time for less drama and more fighting," On April 5, ESPN reported that Mexican boxer, Jaime Munguia (28-0, 24 KOs), a 21 year old untested prospect who previously fought at welterweight and light middleweight was going to step in and fight Golovkin. Later that day, Lance Pugmire of LA Times stated sources close to NSAC, although Tom Loeffler hadn't submitted any names forward, if Munguia's name was mentioned, it would not be approved. Derevyanchenko's promoter, Lou DiBella petitioned to the IBF to force a mandatory. With less than a month before the scheduled fight date, the NSAC cancelled the fight, meaning it would not take place at the MGM Grand. Prior to the NSAC cancelling the bout, Lance Pugmire of LA Times reported that Golovkin would still fight on May 5, however it would take place at the StubHub Center in Carson, California on regular HBO. Former light middleweight world title challenger and California local Vanes Martirosyan (36-3-1, 21 KOs) became a front runner to challenge Golovkin. The IBF stated they would not sanction their belt if the fight was made and Golovkin could potentially be stripped of his title. Martirosyan was criticised as an opponent as he had been a career light middleweight, he was coming off a loss and he had not fought in two years. The WBC approved Martirosyan as a late replace opponent. On April 18, Martirosyan was confirmed as Golovkin's opponent, with the event being billed as 'Mexican Style 2' on May 5 at the StubHub Center. A day later the IBF stated that neither Golovkin or Loeffler made any request for exception, however if and when they did, the IBF would consider the request. On April 27, the IBF agreed to sanction the bout as long as Golovkin would make a mandatory defence against Derevyanchenko by August 3, 2018. On fight night, in front of 7,837 fans, Golovkin knocked Martirosyan out in round 2 to tie Bernard Hopkins record of 20 consecutive middleweight title defences. Golovkin applied pressure immediately backing Martirosyan against the ropes and landing his jab. Martirosyan had short success at the end of round 1 when he landed a combination of punches. Again at the start of round 2, Golovkin started quick. He landed a right uppercut followed by a body shot. He then connected with nine power shots which were unanswered and eventually Martirosyan fell face first to the canvas. Referee Jack Reiss made a full 10-count. The time of stoppage was 1 minute. 53 seconds. Speaking off Golovkin's power in the post-fight, Martirosyan said it felt like he was 'being hit by a train.' Golovkin said, "It feels great to get a knockout. Vanes is a very good fighter. He caught me a few times in the first round. In the second round, I came out all business after I felt him out in the first round." For the fight, Golovkin landed 36 of 84 punches thrown (43%) and Martirosyan landed 18 of his 73 thrown (25%). Golovkin's purse for the fight was $1 million and Martirosyan earned a smaller amount of $225,000. The fight averaged 1,249,000 viewers and peaked at 1,361,000 viewers, making most-watched boxing match on cable television in 2018. On June 6, Golovkin was stripped of his IBF world title due to not adhering to the IBF rules. The IBF granted Golovkin an exception to fight Martirosyan although they would not sanction the fight, however told Golovkin's team to start negotiating and fight mandatory challenger Sergiy Derevyanchenko by August 3, 2018. The IBF released a statement in detail. On June 7, Golovkin's team stated they would accept a 55-45 split in favour of Álvarez. The split in the initial rematch negotiations, Golovkin accepted a 65-35 split in favour of Álvarez. On June 12, Golden Boy gave Golovkin a 24-hour deadline to accept a 57½-42½ split in Álvarez's favour or they would explore other fights. At this time, Golden Boy were already in light negotiations with Eddie Hearn for a fight against Daniel Jacobs instead. At the same time, Loeffler was working closely with Frank Warren to match Saunders with Golovkin for the end of August. Golovkin declined the offer and De La Hoya stated there would be no rematch. Despite this, some sources indicated both sides were still negotiating after a "Hail Mary" idea came to light. Hours later, De La Hoya confirmed via his Twitter account that terms had been agreed and the fight would indeed take place on September 15 at the T-Mobile Arena in Paradise, Nevada. Golovkin revealed to ESPN he agreed to 45%. Álvarez started training for the bout on June 14 and stated his intention to apply for his boxing license on August 18. It was confirmed that both boxers would not physically come face to face with each other until the fight week. A split-screen press conference took place on July 3. On September 3, due to a majority vote of the panel, it was announced vacant The Ring Magazine middleweight title would be contested for the bout. Doug Fischer wrote, "We posed the question to the Ratings Panel, which, in a landslide, voted in favour the magazine’s 160-pound championship being up for grabs when the two stars clash at T-Mobile Arena in Las Vegas." The fight was much different to the first bout in terms of action. Alvarez, who was described by Golovkin's team as a 'runner', altered his style and became more aggressive. Both boxers found use of their respective jabs from the opening round with Golovkin using his jab more as the fight went on. Big punches were landed by both fighters during the bout, with both Alvarez and Golovkin showing excellent chins. Despite the tense build up, both boxers showed each other respect after the fight. Alvarez made good use of his body attack, landing 46 compared to Golovkin's 6 landed. Compubox Stats showed that Golovkin landed 234 of 879 punches thrown (27%) and Alvarez landed 202 of his 622 punches (33%). In eight of the 12 rounds, Golovkin outlanded Alvarez. In the post-fight interviews, through a translator, Alvarez said, “I showed my victory with facts. He was the one who was backing up. I feel satisfied because I gave a great fight. It was a clear victory.” He continued, “That was a great fight. But in the end, it was a victory for Mexico. And again, it was an opportunity. And I want to shout out to my opponent, the best in the sport of boxing. I am a great fighter, and I showed it tonight. If the people want another round, I’ll do it again. But for right now, I will enjoy time with my family.” Golovkin did not take part in the post fight and made his way backstage, where he received stitches for a cut over his right eye. He later responded to the defeat, "I'm not going to say who won tonight, because the victory belongs to Canelo, according to the judges. I thought it was a very good fight for the fans and very exciting. I thought I fought better than he did." Golovkin's trainer Abel Sanchez, who was very critical of Alvarez following the first fight, said, “We had a great fight, the one we expected the first time around. I had it close going into the 12th round. We had good judges, who saw it from different angles. I can’t complain about the decision, but it’s close enough to warrant a third fight. Canelo fought a great fight. Congratulations.” Both fighters were open to a trilogy. The fight generated a live gate of $23,473,500 from 16,732 tickets sold. This was lower than the first bout, however the fourth largest-grossing gates in Nevada boxing history. The fight sold 1.1 million PPV buys, lower than the first bout, however due to being priced at $84.95, it generated more revenue at around $94 million. 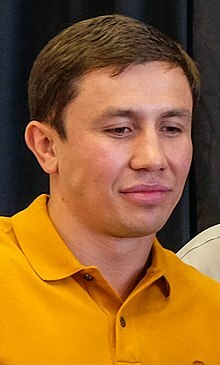 In 2006 Golovkin moved from his native Kazakhstan to Stuttgart, Germany, and then in late 2014 to Santa Monica, California, where he currently lives with his family. He trains in Big Bear, California. He and his wife Alina have a son, Vadim, who is in primary school, and a daughter, who was born days before his fight with Canelo Alvarez. Golovkin speaks four languages: Kazakh, Russian, German, and English. His fraternal twin brother, Maxim, an amateur boxer, joined Gennady's camp and team in 2012. Golovkin said that he wanted his son to attend school in California, because his training camp, team and promotions are based in California, he has many friends there, and he considers it a beautiful place. Golovkin's favorite food is beef. Golovkin enjoys playing games with his son and spending time with his family. ^ "Ratings". The Ring. 7 October 2018. Retrieved 10 October 2018. ^ "Ratings". BoxRec. Retrieved 10 October 2018. ^ "P4P". Transnational Boxing Rankings Board. Retrieved 10 October 2018. ^ Al, Riath. "Gennady Golovkin: Anatomy of the God of War... fists of steel, dancing feet, a granite chin and the aura of a master". Dailymail.co.uk. Retrieved 2016-04-28. ^ "Can anyone beat Gennady Golovkin?". Boxingnews24.com. 2015-10-18. Retrieved 2016-04-28. ^ "Gennady Golovkin's running out of opponents and might have to fight Andre Ward after Marco Antonio Rub Meet Gennady Golovkin". ESPN. October 17, 2014. Retrieved February 17, 2015. ^ Chris Mannix (January 18, 2013). "Heartbreak spearheads Gennady Golovkin's rise, more boxing notebook". Sports Illustrated. Retrieved May 13, 2016. ^ Mannix, C. (2013). Heartbreak spearheads Gennady Golovkin's rise. International Boxing Organization. Retrieved November 27, 2016, from link. ^ In a video titled, "The real Gennady Golovkin: Childhood days in Kazakhstan, discovering boxing, and more [Part 1]", published on YouTube on 24 June 2013, Golovkin talked about his earliest boxing gym memories when he said, "We're, me and my Max, we're going, ten years old, just ten years, we're going to boxing gym, my older brother, just going with boxing gym, just is very good, just for playing, basketball and soccer. You know, just big interest for the small child. Is very good first my trainer, because he can working with small childs, you know, just for, for small baby just, okay guys, just, where you lag. Just little bit, not every time, not very mad, not very angry. Just very good atmosphere in gym. I remember first five years, were just not playing, just, yeah, just like game. You know, like a computer game, like Sony or Xbox, just game. Is very funny." This quote starts at the 2:31 min mark of the video and ends at the 3:26 min. ^ "Golovkin heads to US with middleweight title hopes – The Washington Times". Greg Beacham. Retrieved 2013-01-16. ^ "Pirog Realizes Golovkin Bout Could Cost The WBO Belt". BoxingScene.com. Retrieved 2017-12-12. ^ Stangrit, Gregory (23 June 2013). "Dmitry Pirog is Still Hoping To Return To The Ring". BoxingScene. Retrieved 25 January 2016. ^ Pushkin, Vadim (11 January 2016). "Dmitry Pirog Comeback Rumors Are False, Says Promoter". BoxingScene. Retrieved 25 January 2016. ^ "Proksa Ready To Rumble With Golovkin on September 1". BoxingScene.com. Retrieved 2017-12-20. ^ "Golovkin Ready - Proksa is Up First, Pirog Still in The Mix". BoxingScene.com. Retrieved 2017-12-20. ^ "Gennady Golovkin wins fight – ESPN Boxing". Associated Press. Retrieved 2013-01-16. ^ "Gennady Golovkin Beats Down Proksa Over Five". BoxingScene.com. Retrieved 2017-12-20. ^ "Grzegorz Proksa is in Awe of Golovkin's Punching Power". BoxingScene.com. Retrieved 2017-12-20. ^ "Golovkin vs. Proksa - CompuBox Stats". www.boxingscene.com. Retrieved 2017-12-20. ^ "Golovkin-Rosado on Tap For For January 19th, HBO". BoxingScene.com. Retrieved 2017-12-20. ^ "Gennady Golovkin To Face Rosado at a Catch-Weight". BoxingScene.com. Retrieved 2017-12-20. ^ "Rosado Rejects Catch-Weight: I'll Face Golovkin at 160!". BoxingScene.com. Retrieved 2017-12-20. ^ "Gennady Golovkin Batters Gabriel Rosado In Seven Rounds". BoxingScene.com. Retrieved 2017-12-20. ^ "Golovkin vs. Rosado - CompuBox Stats". www.boxingscene.com. Retrieved 2017-12-20. ^ "Gennady Golovkin vs. Nobuhiro Ishida possible for March 30th in Monte Carlo » Boxing News". Boxing News 24. 2013-01-30. Retrieved 2017-07-14. ^ "Gennady Golovkin vs Nobuhiro Ishida March 30". Boxing | ESNews | Elie Seckbach | Mayweather | Pacquiao | Boxing News. Retrieved 2017-07-14. ^ Brian Campbell (March 30, 2013). "Golovkin stays busy but ready for true test". ESPN. Retrieved March 31, 2013. ^ Alexey Sukachev (March 30, 2013). "Golovkin Stops Ishida Easy: Rodriguez and Grachev Win". BoxingScene.com. Retrieved March 31, 2013. ^ "Golovkin stops Ishida in third round with single shot". The Ring. March 30, 2013. Archived from the original on October 29, 2013. Retrieved March 31, 2013. ^ "Golovkin vs. Macklin Finalized For 6/29 at Foxwoods, HBO". BoxingScene.com. Retrieved 2017-12-12. ^ "Golovkin-Macklin formally announced at NYC presser - The Ring". The Ring. 2013-04-14. Retrieved 2017-03-31. ^ "Golovkin Eyes Two More Fights in 2013 After Macklin Bout". BoxingScene.com. Retrieved 2017-12-12. ^ "Golovkin KO proves he's here to stay". ESPN.com. Retrieved 2017-03-31. ^ "Golovkin vs. Macklin - CompuBox". www.boxingscene.com. Retrieved 2017-12-12. ^ "Results: Golovkin knocks out Macklin in three". Bad Left Hook. 2013-06-29. Retrieved 2017-03-31. ^ "Golovkin-Macklin tops 1M viewers". Bad Left Hook. Retrieved 2017-12-12. ^ "Gennady Golovkin vs. Curtis Stevens bout set for November 2nd » Boxing News". Boxing News 24. 2013-08-18. Retrieved 2017-11-19. ^ "Golovkin versus Stevens live round-by-round updates – Ring TV". Ringtv.craveonline.com. 2013-11-01. Archived from the original on 2013-11-11. Retrieved 2016-04-28. ^ "Golovkin defeats Stevens; Perez and Afolabi both win". Boxingnews24.com. 2013-11-02. Retrieved 2014-06-28. ^ "Golovkin beats down Stevens in eight". Bad Left Hook. Retrieved 2017-11-19. ^ "Golovkin smashes Stevens for TKO". ESPN.com. Retrieved 2017-11-19. ^ "Gennady Golovkin proves to be a big hit with HBO viewers". Retrieved 2017-11-19. ^ "WBA will NOT recognize Chudinov as interim champion, Murray-Fletcher for interim (not regular) belt, Golovkin denied "super" status". ESPN. December 4, 2013. Archived from the original on February 1, 2014. Retrieved December 28, 2013. ^ "Official Press Conference for Gennady Golovkin vs Osumanu Adama • r/Boxing". reddit. Retrieved 2017-07-14. ^ "HBO can not televise Gennady Golovkin-Osumanu Adama - The Ring". The Ring. 2014-01-21. Retrieved 2017-07-14. ^ "Golovkin beats Adama by TKO to keep belt". ESPN.com. Retrieved 2017-07-14. ^ "Golovkin defeats Adama by 7th round quick stoppage". Eastsideboxing.com. 2014-02-01. Retrieved 2014-06-28. ^ "Golovkin stops Adama in seven". Bad Left Hook. Retrieved 2017-07-14. ^ "Gennady Golovkin-Andy Lee is Pondered For April 26". BoxingScene.com. Retrieved 2017-12-12. ^ "UK Insider: Golovkin-Lee is Close, Martin Ward, More". BoxingScene.com. Retrieved 2017-12-12. ^ "Golovkin's April 26 Fight Off Due to Father's Passing". BoxingScene.com. Retrieved 2017-12-12. ^ "Gennady Golovkin is appointed to super champion | World Boxing Association". Wbanews.com. Retrieved 2014-06-28. ^ "Golovkin vs Geale by the Numbers". Mainevent. 2014-07-23. ^ "Golovkin vs. Geale: Saturday, July 26 Live on HBO - Boxing News". 2014-06-03. Retrieved 2017-07-14. ^ "Golovkin stops Geale in 3rd round, retains title". ESPN.com. Retrieved 2017-07-14. ^ "Golovkin stops Geale in third round". Bad Left Hook. Retrieved 2017-07-14. ^ "Purses: GGG $750K, Geale $600k, Jennings $130k, Perez $60k » Boxing News". Boxing News 24. 2014-07-24. Retrieved 2018-03-16. ^ "GGG's viewership figures down". ESPN.com. Retrieved 2017-11-19. ^ "Rubio next for GGG?". Bad Left Hook. 2014-08-15. Retrieved 2017-04-01. ^ "Golovkin-Rubio fight set for Oct. 18 in Calif". ESPN.com. Retrieved 2014-04-01. ^ "Weights: Golovkin set, Rubio heavy, fight still on". Bad Left Hook. 2014-10-17. Retrieved 2017-04-01. ^ "Gennady Golovkin beats Marco Antonio Rubio to defend his WBA middleweight title". Sky Sports. October 19, 2014. Retrieved April 1, 2017. ^ "Golovkin KO's Rubio in 2nd round, keeps title". ESPN.com. Retrieved 2017-04-01. ^ "Golovkin-Rubio brings in 1.3 million viewers on HBO, a huge hit! » Boxing News". Boxing News 24. 2014-10-21. Retrieved 2017-11-19. ^ "IT'S ON! GGG GOLOVKIN VS MARTIN MURRAY - Boxing News - Boxing, UFC and MMA News, Fight Results, Schedule, Rankings, Videos and More". Boxing News - Boxing, UFC and MMA News, Fight Results, Schedule, Rankings, Videos and More. Retrieved 2017-09-13. ^ "Martin Murray: Gennady Golovkin beats brave Briton in Monaco". BBC Sport. 2015-02-22. Retrieved 2017-09-13. ^ "Golovkin stops tough Murray in 11". Bad Left Hook. Retrieved 2017-09-13. ^ "Gennady Golovkin ups KO streak". ESPN. Retrieved March 3, 2015. ^ "Golovkin-Murray averages 862K viewers on HBO for afternoon show » Boxing News". Boxing News 24. 2015-02-24. Retrieved 2017-11-19. ^ "Gennady Golovkin vs Willie Monroe Jr. Announced For LA Forum | BoxingInsider.com". BoxingInsider.com. 2015-03-19. Retrieved 2017-09-13. ^ "Golovkin stops Monroe in 6th, extends KO streak". ESPN.com. Retrieved 2017-09-13. ^ "Golovkin makes it 20 straight stoppages". Bad Left Hook. Retrieved 2017-09-13. ^ "Golovkin-Monroe purses: GGG $1.5M, Monroe $100K » Boxing News". Boxing News 24. 2015-05-16. Retrieved 2018-03-16. ^ "Golovkin-Monroe Draws Audience of More than 1.3 Million - Boxing News". www.boxingscene.com. Retrieved 2017-09-13. ^ "Golovkin stops Lemieux by TKO in eighth round". ESPN.com. Retrieved 2017-05-19. ^ "GGG-Lemieux generates about 150,000 buys". ESPN.com. Retrieved 2017-05-19. ^ "Crawford and GGG replay draw 1.07M avg on HBO Saturday : MMAPayout.com: The Business of MMA". mmapayout.com. Retrieved 2017-05-19. ^ "Golovkin-Wade formally announced for April 23 in Inglewood – Ring TV". Ringtv.craveonline.com. 2016-02-10. Archived from the original on 2016-03-16. Retrieved 2016-04-28. ^ "Golovkin knocks out Wade, tells Canelo 'let's fight'". ESPN.com. Retrieved 2017-11-14. ^ "Gennady Golovkin beats Dominic Wade for 22nd straight knockout". BBC Sport. 2016-04-24. Retrieved 2016-04-28. ^ "Golovkin smashes Wade in two rounds". Bad Left Hook. Retrieved 2017-11-14. ^ "Golovkin scores highest HBO boxing ratings of 2016". Bad Left Hook. 2016-04-26. Retrieved 2017-05-19. ^ "Alvarez, Golovkin agree to allow interim bouts". ESPN.com. Retrieved 2015-12-17. ^ "Golovkin-Canelo reportedly agreed to, likely for September 2016". Bad Left Hook. Retrieved 2015-12-17. ^ "GGG to defend belts against Brook on Sept. 10". Retrieved July 11, 2016. ^ "Golovkin's WBA title not on line in Brook fight". ESPN.com. Retrieved 2017-09-14. ^ "WBA Declines To Sanction Golovkin-Brook Middleweight Bout - Boxing News". www.boxingscene.com. Retrieved 2017-09-14. ^ "Kell Brook's brave title bid ended by fearsome champion Gennady Golovkin". Guardian. 10 September 2016. Retrieved 13 September 2016. ^ "Golovkin vs Brook: Kell Brook stopped by Gennady Golovkin after five rounds". Sky Sports. September 11, 2016. Retrieved September 26, 2016. ^ "Golovkin stops Brook after corner throws in towel". ESPN.com. 2016-09-10. Retrieved 2018-12-29. ^ "GGG draws 843K HBO viewers for Saturday afternoon fight : MMAPayout.com: The Business of MMA". mmapayout.com. Retrieved May 19, 2017. ^ "Kell Brook vs Gennady Golovkin Purse Payouts (Confirmed)". TOTAL SPORTEK. 2016-08-31. Retrieved 2018-12-29. ^ Davies, Gareth A. (2016-09-03). "Gennady Golovkin vs Kell Brook: Triple G says he wants to win over 'true fans' in the UK". The Telegraph. ISSN 0307-1235. Retrieved 2018-12-29. ^ "Team Golovkin wants Saunders after Jacobs fight – Boxing News". Boxing News 24. 2016-09-19. Retrieved 2016-10-19. ^ "Golovkin-Jacobs targeted for Dec. 10 at MSG". ESPN.com. Retrieved 2016-10-19. ^ "Golovkin to start training this week for December 10 fight – Boxing News". Boxing News 24. 2016-10-17. Retrieved 2016-10-19. ^ "Golovkin-Jacobs: The WBA Wants Deal, Gives Purse Bid Extension – Boxing News". www.boxingscene.com. Retrieved 2016-10-19. ^ "Golovkin-Jacobs: WBA Denies Request To Modify Purse Bid Split – Boxing News". www.boxingscene.com. Retrieved 2016-10-19. ^ Times, Los Angeles. "Gennady Golovkin-Daniel Jacobs fight moved off Dec. 10, aiming for early 2017 date". latimes.com. Retrieved 2016-10-19. ^ "Gennady Golovkin and Daniel Jacobs have been unable to agree a fight in December". Sky Sports. October 19, 2016. Retrieved October 19, 2016. ^ Rafael, Dan (October 18, 2016). "Gennady Golovkin-Daniel Jacobs fight won't happen Dec. 10 due to ongoing talks". ESPN.com. Retrieved October 22, 2016. ^ "Golovkin and Jacobs have until 5 p.m. ET to make deal – The Ring". The Ring. 2016-12-07. Retrieved 2016-12-07. ^ "WBA announces purse bids | Boxing News". Boxing News. 2016-12-07. Archived from the original on 2016-12-09. Retrieved 2016-12-08. ^ "If Haymon wins purse bid, GGG-Jacobs goes to regular Showtime – The Ring". The Ring. 2016-12-14. Retrieved 2016-12-17. ^ "GGG and Jacobs make deal for March 18 at MSG on HBO PPV – The Ring". The Ring. 2016-12-17. Retrieved 2016-12-17. ^ "Golovkin vs. Jacobs Deal Done – March 18 at MSG, HBO PPV – Boxing News". www.boxingscene.com. Retrieved 2016-12-17. ^ "Book it: GGG-Jacobs set for March 18 at MSG". ESPN.com. Retrieved 2016-12-17. ^ "HBO Sports Officially Announces Golovkin-Jacobs for 3/18 at MSG". Boxing Scene. December 22, 2016. Retrieved December 22, 2016. ^ "Gennady Golovkin vs. Daniel Jacobs: There is NO Rematch Clause - Boxing News". www.boxingscene.com. Retrieved 2017-03-13. ^ Rafael, Dan (2017-03-18). "Daniel Jacobs blows off weight check, can't win IBF title vs. Gennady Golovkin". ESPN.com. Retrieved 2017-03-18. ^ "Gennady Golovkin vs. Daniel Jacobs Official Scorecards - Photo - Boxing News". www.boxingscene.com. Retrieved 2017-03-20. ^ "Golovkin emerges in slim decision over Jacobs". ESPN.com. Retrieved 2017-03-20. ^ "Gennady Golovkin defends middleweight titles against Daniel Jacobs". BBC Sport. 2017-03-19. Retrieved 2017-03-20. ^ "Golovkin wins close decision against resilient Jacobs - The Ring". The Ring. 2017-03-18. Retrieved 2017-03-20. ^ "Loeffler Confirms Golovkin-Jacobs Did About 170K PPV Buys - Boxing News". www.boxingscene.com. Retrieved 2017-03-25. ^ "GGG-Jacobs replay draws 709,000 viewers : MMAPayout.com: The Business of MMA". mmapayout.com. Retrieved 2017-05-19. ^ "Report: Golovkin-Jacobs did estimated 130,000-150,000 PPV buys". Bloody Elbow. 2017-03-21. Retrieved 2017-03-25. ^ "Golovkin: Billy Joe Saunders is The Last One, It is My Dream! - Boxing News". www.boxingscene.com. Retrieved 2017-04-07. ^ "Billy Joe Saunders could fight Gennady Golovkin in London". Evening Standard. 2017-03-20. Retrieved 2017-04-07. ^ ""I'm ready!" – Saunders wants Golovkin unification". www.boxnation.com. Retrieved 2017-04-08. ^ Ltd, Vitalnetwork. "Vital Boxing | Saunders Gives Golovkin a Deadline". www.vitalboxing.com. Retrieved 2017-04-08. ^ "Frank Warren Hits Golovkin With Deadline To Ink Saunders Deal - Boxing News". www.boxingscene.com. Retrieved 2017-04-08. ^ "Saunders' Promoter: We Have NOT Moved On From Golovkin - Boxing News". www.boxingscene.com. Retrieved 2017-04-08. ^ BoxingNewsAndViews (2017-04-03). "Billy Joe Saunders T-Shirt Message For Gennady Golovkin - Boxing News". Boxing News and Views. Retrieved 2017-04-08. ^ "Warren: Golovkin Injury Holding Up Getting GGG-Saunders Done - Boxing News". www.boxingscene.com. Retrieved 2017-04-08. ^ "Report: Gennady Golovkin to skip June return and focus on Canelo Alvarez". CBSSports.com. Retrieved 2017-04-12. ^ "GGG not planning to attend Canelo-Chavez clash • Boxing News". Boxing News. 2017-05-01. Archived from the original on 2017-05-02. Retrieved 2017-05-08. ^ Rafael, Dan (2017-05-07). "Canelo Alvarez routs Julio Cesar Chavez Jr.; Golovkin fight official". ESPN.com. Retrieved 2017-05-07. ^ "Photos: Canelo, Golovkin - Face To Face at Post-Fight Presser! - Boxing News". www.boxingscene.com. Retrieved 2017-05-08. ^ "Immediate Rematch Clause for Canelo, But Not for Golovkin - Boxing News". www.boxingscene.com. Retrieved 2017-05-10. ^ "De La Hoya: Weight for Canelo-GGG is 160; No Rehydration Clause - Boxing News". www.boxingscene.com. Retrieved 2017-05-10. ^ "Canelo vs. Golovkin Lands at T-Mobile Arena in Las Vegas - Boxing News". www.boxingscene.com. Retrieved 2017-06-10. ^ "Canelo Agrees To IBF Title, Says "NO" To WBC Title in GGG Bout - Boxing News". www.boxingscene.com. Retrieved 2017-06-21. ^ "Canelo vs. Golovkin is Sold Out! - Boxing News". www.boxingscene.com. Retrieved 2017-07-07. ^ "Canelo Won't Skip IBF's Second-Day Weigh-In for Golovkin Fight - Boxing News". www.boxingscene.com. Retrieved 2017-08-23. ^ "IBF Abolishes Second Weigh-in For Unification Bouts - Boxing News". www.boxingscene.com. Retrieved 2017-08-23. ^ Vegas, Chris McKenna in Las (2017-09-13). "Canelo vs GGG: When is the fight? How much will they earn? When is the weigh-in?". Express.co.uk. Retrieved 2017-09-13. ^ Graham, Bryan Armen (2017-09-17). "Gennady Golovkin and Canelo Álvarez fight to controversial split draw – as it happened". The Guardian. ISSN 0261-3077. Retrieved 2017-09-20. ^ Graham, Chris (2017-09-17). "'A federal offence': Judge Adalaide Byrd under fire for GGG-Canelo scorecard". The Telegraph. ISSN 0307-1235. Retrieved 2017-09-20. ^ "Gennady Golovkin vs. Canelo Álvarez was a great fight marred by bad judging". SBNation.com. Retrieved 2017-09-20. ^ "Classic fight between Golovkin and Alvarez ends in a draw". Los Angeles Times. ISSN 0458-3035. Retrieved 2017-09-20. ^ "Canelo vs. GGG fight results, scorecard, highlights: Alvarez, Golovkin box to a draw". CBSSports.com. Retrieved 2017-09-20. ^ "Canelo vs Golovkin results: Fight ends in disputed draw". Bad Left Hook. Retrieved 2017-09-20. ^ "Canelo Alvarez, Gennady Golovkin Battle To a Split Draw - Boxing News". www.boxingscene.com. Retrieved 2017-09-20. ^ "Canelo-GGG Replay Peaks at 840K Viewers, Averages 726K on HBO - Boxing News". www.boxingscene.com. Retrieved 2017-09-26. ^ "Canelo-GGG ends in draw; fighters want rematch". ESPN.com. Retrieved 2017-09-20. ^ "GGG vs Canelo: Gennady Golovkin and Saul Alvarez's Las Vegas megafight ends in draw". Sky Sports. Retrieved 2017-09-20. ^ "GGG vs Canelo: Gennady Golovkin blasts 'terrible' decision after drawn Las Vegas bout". Sky Sports. Retrieved 2017-09-20. ^ "Sanchez: Byrd Had Canelo-GGG Scorecard Filled Out Before Fight - Boxing News". www.boxingscene.com. Retrieved 2017-09-20. ^ "Canelo Confirms Return in May; Won't Commit to Golovkin Rematch - Boxing News". www.boxingscene.com. Retrieved 2017-09-20. ^ "Saunders Now Hoping To Have Unification With Golovkin - Boxing News". www.boxingscene.com. Retrieved 2017-09-20. ^ "Alvarez-Golovkin record 3rd-biggest gate". ESPN.com. Retrieved 2017-09-27. ^ "Report: Canelo-Golovkin Fight Produced 1.3 Million PPV Buys - Boxing News". www.boxingscene.com. Retrieved 2017-09-28. ^ Daniels, Tim. "Canelo Alvarez vs. Gennady Golovkin Rematch Discussions Reportedly Underway". Bleacher Report. Retrieved 2017-09-24. ^ "Canelo Alvarez-Gennady Golovkin II negotiations will begin Friday - The Ring". The Ring. 2017-09-21. Retrieved 2017-09-24. ^ "Golden Boy Prez: Canelo-GGG II in Talks, Could Happen in May - Boxing News". www.boxingscene.com. Retrieved 2017-09-24. ^ "WBC orders rematch for Golovkin and Alvarez". ESPN.com. Retrieved 2017-10-03. ^ "WBC orders Golovkin-Alvarez rematch". fightnews.com. 2017-10-02. Retrieved 2017-10-03. ^ "Canelo Will Make Decision on Golovkin Rematch in a Few Weeks - Boxing News". www.boxingscene.com. Retrieved 2017-11-07. ^ "Hearn: Golovkin Can Fight Jacobs Next if No Canelo Rematch - Boxing News". www.boxingscene.com. Retrieved 2017-11-15. ^ "Canelo Gives Golden Boy 'Green Light' To Finalize Golovkin Bout". BoxingScene.com. Retrieved 2017-12-20. ^ "GGG-Canelo rematch set for May 5; site TBD". ESPN.com. Retrieved 2018-01-30. ^ "Canelo vs. Golovkin Rematch Finalized For May 5, HBO PPV". BoxingScene.com. Retrieved 2018-01-30. ^ "Golovkin-Alvarez II set for May 5 in Las Vegas". ESPN.com. Retrieved 2018-02-23. ^ "Canelo Will Fight Golovkin For WBC Belt, Says Sulaiman". BoxingScene.com. Retrieved 2018-02-28. ^ "Canelo Alverez Tests Positive for Banned Substance, Blames Mexican Cows". TMZ. Retrieved 2018-03-06. ^ "Sanchez: Canelo's Hand Wraps for Golovkin Fight Were Illegal". ^ "Canelo temporarily suspended over two tests". ESPN.com. Retrieved 2018-03-24. ^ "Golovkin, Regardless of What Happens, Aims To Fight on May 5". BoxingScene.com. Retrieved 2018-03-27. ^ "Andrade: I'm Ready To Replace Canelo, Fight Golovkin on May 5". BoxingScene.com. Retrieved 2018-03-27. ^ "Manager: Derevyanchenko Ready to Sub for Canelo, Fight Golovkin". BoxingScene.com. Retrieved 2018-03-29. ^ "Canelo-Golovkin Rematch: Full Refunds Being Offered for Tickets". BoxingScene.com. Retrieved 2018-03-29. ^ "Refunds offered in Canelo-GGG rematch". ESPN.com. Retrieved 2018-03-29. ^ "Canelo-GGG II unlikely as NSAC files complaint". ESPN.com. Retrieved 2018-03-30. ^ "Canelo Could Take a Big Hit if NSAC Issues 1-Year Suspension". BoxingScene.com. Retrieved 2018-03-30. ^ "Canelo withdraws from May 5 bout with GGG". ESPN.com. Retrieved 2018-04-04. ^ "NSAC: Canelo to serve 6-month suspension". ESPN.com. Retrieved 2018-04-19. ^ "Golovkin's Promoter: Don't Cancel Plans, GGG Will Fight on May 5". BoxingScene.com. Retrieved 2018-04-04. ^ "Golovkin's Promoter Reacts To Canelo's Withdrawal, Talks May 5". BoxingScene.com. Retrieved 2018-04-04. ^ "Golovkin: I Look Forward To Headlining on Cinco De Mayo!". BoxingScene.com. Retrieved 2018-04-04. ^ "Report: Mexico's Jamie Munguia Will Be Golovkin's Opponent May 5". BoxingScene.com. Retrieved 2018-04-06. ^ "NSAC Won't Approve Munguia as Golovkin's Opponent for May 5". BoxingScene.com. Retrieved 2018-04-06. ^ "IBF to GGG: Risk your belt if you fight Vanes". ESPN.com. Retrieved 2018-04-19. ^ "WBC Prez Praises Vanes: He is Worthy Opponent For Golovkin". BoxingScene.com. Retrieved 2018-04-19. ^ "Golovkin-Martirosyan bout finalized for May 5". ESPN.com. Retrieved 2018-04-19. ^ Jay, Phil. "EXCLUSIVE: Golovkin YET TO ASK for Martirosyan FIGHT EXCEPTION, IBF confirm they will CONSIDER it". WBN - World Boxing News. Retrieved 2018-04-19. ^ "Golovkin vs. Derevyanchenko is Ordered By The IBF". BoxingScene.com. Retrieved 2018-05-03. ^ "Gennady Golovkin Blasts Out Vanes Martirosyan in Two Rounds". BoxingScene.com. Retrieved 2018-05-07. ^ "Gennady Golovkin stops Vanes Martirosyan to retain middleweight titles". Sky Sports. Retrieved 2018-05-07. ^ "GGG ties Hopkins' mark with KO of Martirosyan". ESPN.com. Retrieved 2018-05-07. ^ "Golovkin-Martirosyan Cable's Most-Watched Boxing Match in 2018". BoxingScene.com. Retrieved 2018-05-08. ^ "GGG, Alvarez still talking after deadline passes". ESPN.com. Retrieved 2018-07-03. ^ "Golovkin Declines Golden Boy's Final Offer for Canelo Rematch". BoxingScene.com. Retrieved 2018-07-03. ^ "GGG, Alvarez finalize deal for Sept. 15 rematch". ESPN.com. Retrieved 2018-07-03. ^ "Gennady Golovkin v Saul 'Canelo' Alvarez: Rematch to take place on 15 September". BBC Sport. 2018-06-13. Retrieved 2018-07-03. ^ "Sources: Canelo-GGG sold 1.1 million PPV buys". ESPN.com. Retrieved 2018-10-10. ^ "Canelo-GGG Rematch Earned Less $$$ From Tickets Than 1st Fight". BoxingScene.com. Retrieved 2018-10-10. ^ Middleweight champ Golovkin wants 4 fights in 2015. USAToday.com, retrieved August 3, 2015. ^ Ken Hissner (January 16, 2013). "Boxing Interview with Gennady "Triple G" Golovkin". Doghouse Boxing. Retrieved October 11, 2013. ^ ALH EDGAR ESTRADA (September 11, 2012). "Boxing's Best Kept Secret". athleteslivehere.com. Archived from the original on 10 December 2012. Retrieved October 11, 2013. ^ In a video titled, "Champion To Champion – Gennady "GGG" Golovkin – UCN ORIGINAL SERIES", which was published to YouTube on October 13, 2014, Golovkin said, "My son going to school. I want him going school to, in California." The interviewer then asked why Golovkin wanted his son to attend school in California in particular. Golovkin replied, "I living in California. My training camp, my training camp, my team living in California. My promotions living in California. You know, just, I have a lot of friends in California. Just, I feel this city. I feel this stuff. Cali's beautiful. Beautiful weather, beautiful people. You know, just. I think very important, not just for me, for my family. For future. For future, just, for my son, for my wife, same, same. Just, very important for me." The first quote starts at the 10:29 mark of the video, and the second quote ends at the 11:11 mark of the video. ^ In a video titled, "GENNADY GOLOVKIN ANSWERS PERSONAL QUESTIONS ABOUT HIMSELF IN THIS Q&A", which was published to YouTube on January 14, 2015, Golovkin was asked the question by an interviewer, "What's your favorite food?". Golovkin responded, "Uh, my favorite food, I think so. Beef, I like meat. I like beef, lamb, steak, beef." The question by the interviewer starts at the 1:02 mark of the video, and Golovkin's response ends at the 1:13 mark of the video. ^ In a video titled, "GENNADY GOLOVKIN ANSWERS PERSONAL QUESTIONS ABOUT HIMSELF IN THIS Q&A", which was published to YouTube on January 14, 2015, an interviewer asked Golovkin the question, "Your favorite hobby, if you have one, outside of boxing? It could be a sport or it could just be like, anything, painting." Golovkin responded, "Just, just game with my family, game with my son, just time with my family." The interviewer's question starts at the 4:08 mark of the video, and Golovkin's response ends at the 4:20 mark of the video. ^ "Canelo Alvarez's shrinking pay-per-view audience not expected to surpass 300,000 buys". Los Angeles Times. 2016-09-22. ISSN 0458-3035. Archived from the original on 23 September 2016. Retrieved 2017-09-16. ^ "Canelo Alvarez-Gennady Golovkin rematch sold 1.1 million PPV buys". www.espn.com. Retrieved 2017-09-25. ^ Gennady Golovkin Highlights (HBO Boxing) (YouTube video: Fights against Grzegorz Proksa, Gabriel Rosado and Nobuhiro Ishida). HBO Sports. June 17, 2013. Retrieved June 28, 2013. Wikimedia Commons has media related to Gennady Golovkin.